Norma Gorman was able to visit her childhood home and the city of Venice using a virtual reality headset provided by Rendever Health. Norma Gorman could barely contain her excitement as she donned a set of goggles that transported her, in time and space, from her assisted living center in Sudbury to her childhood home in Lynn. 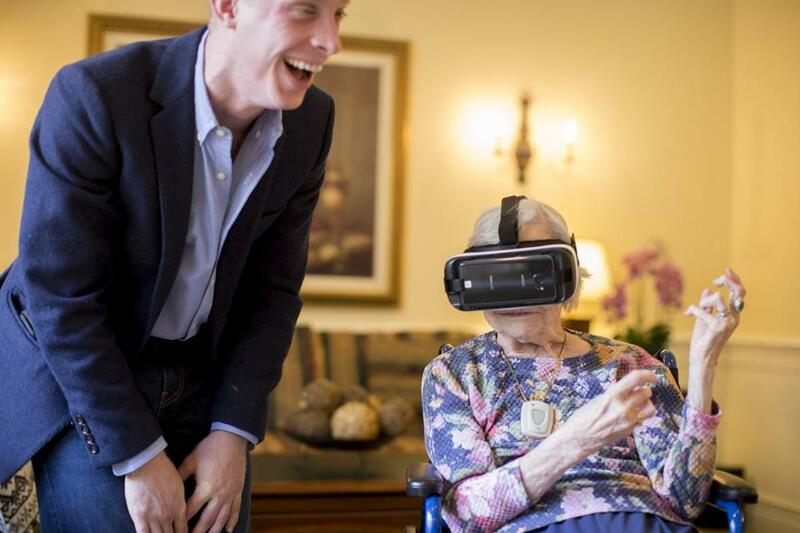 Gorman owes her world travels to Reed Hayes, 28, and Dennis Lally, 27, two MIT Sloan School of Management graduate students whose startup, Rendever Health , is developing virtual reality programs to provide entertainment in assisted living facilities, and down the road, to test and treat seniors for the effects of aging. The pair have been testing the technology at senior centers, the first last fall at Landmark at Longwood in Roxbury, where seniors were transported to the Grand Canyon, explored the solar system aboard a rocketship, and used a paint brush to create a van Gogh from the artist’s viewpoint. With virtual reality technology from Oculus, Rendever uses Gear VR headsets from Samsung that retail for about $100 and work with certain Samsung smartphones. Oculus reported Wednesday more than one million people used the Gear VR headset in April. Skeptics may dismiss virtual reality as a fad, but Hayes and Lally believe Rendever Health is at the forefront of using the technology in clinical research. “We both agreed that virtual reality was a huge new technology coming up that had the ability to disrupt many, many things in health care,” Hayes said. The name Rendever is a mashup of “render,” as in to render a virtual reality game, and “endeavor,” for taking people on virtual adventures. Hayes and Lally have developed their own software platform to use with the VR headsets, including adventures like a trip to Paris or an up close experience with performers from Cirque du Soleil. 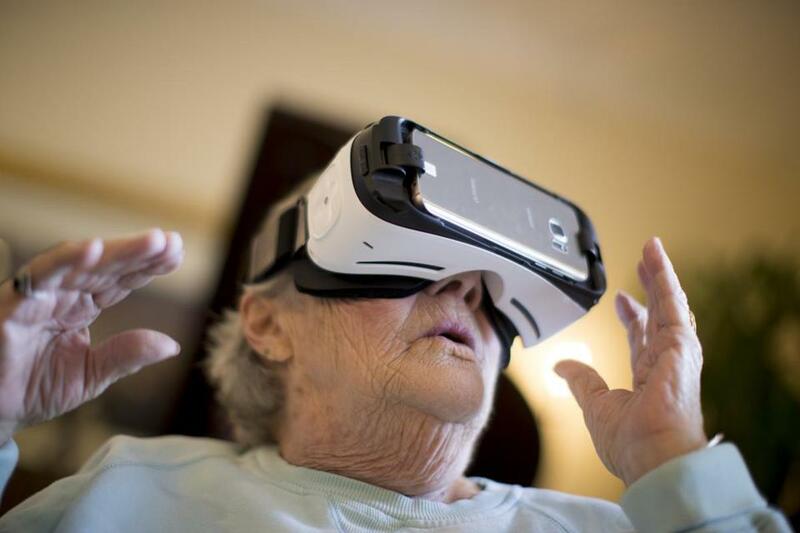 They plan on adding 360-degree virtual reality video cameras so family members can share events, such as weddings, with elderly relatives at an assisted living facility. Rendever Health would provide the facilities with headsets and offer subscription services. They declined to say how much their service will cost. Doris Nakashian, 93, a senior at the Orchard Hill assisted living facility in Sudbury, was transported to various places in a virtual reality demonstration with the assistance of Dennis Lally (left). The duo are also in talks with Massachusetts General Hospital on a clinical study of cognitive therapy for seniors, and another with New York-based Northwell Health on anxiety. Lally reached out to MGH neurologist Dr. Brad Dickerson, who said the technology is so new, that researchers know little about its effects on people. Dickerson, director of the frontotemporal disorders unit at MGH that provides treatment for dementia, said he’d like to use the technology to simulate everyday scenarios, such as driving a car or using an ATM machine, that would allow him to see how an older adult is coping. Hayes and Lally have poured about $13,000 of their own funds into Rendever Health and are looking for investors. They are also participating in MIT’s Global Founders’ Skills Accelerator, a summer program that gives entrepreneurs goals to meet for a chance at $20,000. Rendever has also been accepted to an accelerator in Chattanooga, Tenn. There, they will launch a pilot over the summer at an assisted living facility that will also be their first paying customer. Cliff Hughes, owner of the Orchard Hill facility, said he would “absolutely” consider signing up for the program.